Providing you with the tools to create a safe & productive workplace. It’s time to address the silent threat lurking in your workplace. For over ten years, STANDING FIRM has been a recognized expert in addressing partner violence as a workplace and workforce issue by making employers aware of the vital role they play in addressing partner violence in their organization. Getting started is easy. Employers can join at either the free basic membership or premier membership levels. We then equip their organization with the tools, resources and education they need to take effective organizational action. Your membership starts with a conversation. We help you get started along the pathway to addressing partner violence in your workplace by learning more about your organization and the people you employ. And then we dive deep to develop an action plan that fits your unique needs. Creating a workplace policy is the first step in addressing partner violence in the workplace. 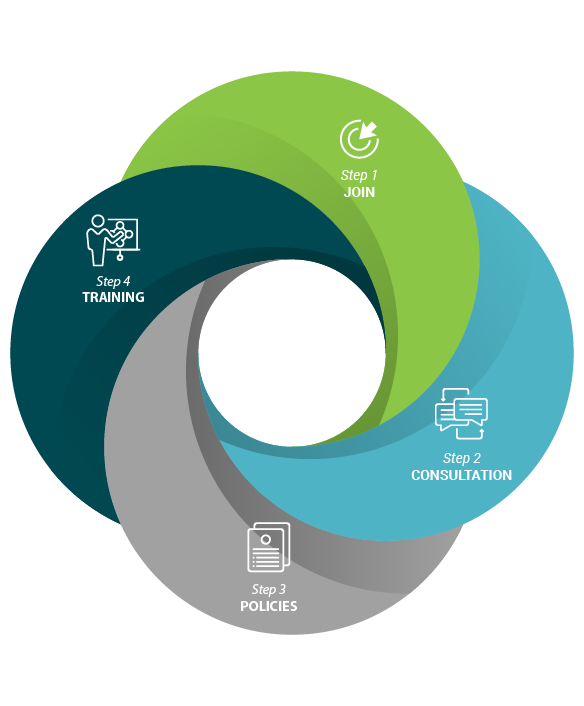 Whether you have a policy in place that could use some work or are starting completely from scratch, our partner violence policy consultants can provide you with a roadmap of next steps. Partner violence shouldn’t be a silent threat. Our flexible training programs educate business leaders, HR professionals, managers and staff on the dangers of partner violence, while empowering them to speak up and put a stop to its effects in your workplace. Stand alongside the hundreds of regional organizations in the fight against partner violence. Become a STANDING FIRM member today.